Elk Hunt 2016 was short and sweet! We had planned to camp in the same spot on the radio tower road, but when Justin got there, there was already people there. So he moved up the road a quarter mile and found another spot. There were several other camps on the road. Usually there is nobody! What is happening to our area? Did all the magazines say this is the hot spot? Opening morning Justin and Travis went up the radio towers trail, while Dave and Steve went to the honey hole. I went over to what we call lover's rock and up. On the atv ride over, I took a wrong turn and went up to the fence line. I can't believe after 20+ years of hunting that I can still make such a mistake. It put me behind, but I decided to stick with my plan. I got to lover's rock and hiked in in the dark. I stalked and glassed my way up the ridge until about 8 am, when I spotted two deer: a doe and her yearling. She was very nervous for some reason and eventually bounded up the hill in the thick oak brush. I was just glassing around and then I spotted him! 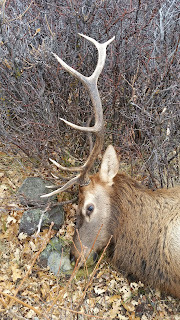 There was a nice bull elk just 300 yards away in the oak brush. There was no way I was going to be able to stalk any closer so I got out my shooting sticks and watched. There were about five cow elk with the bull and a calf. The bull eventually bedded down in the oak brush to where I could just see his antlers and his back. I waited for what seemed like eternity, and finally decided to take the shot. I was sure my first shot was a hit because he didn't move at all. All of the other elk immediately took off, except for the calf. The calf was looking directly at the bull as if to say, "What are we doing? Shouldn't we run??" I again waited for an eternity just watching to see if the bull would run. Eventually I decided to take another shot. I learned the hard way in previous seasons that elk are big tough animals and it often takes multiple hits from the 300 Win Mag to bring them down. I think the second shot was a hit too, because this time he got up and started walking toward me. I excitedly gave him a third and a fourth shot. After the fifth shot, he was sitting down in the oak brush and raising his head as if trying to get a breath. I was very excited and just watched him for quite some time. Finally, his head disappeared in the brush and I made my plan to fight my way over to him. 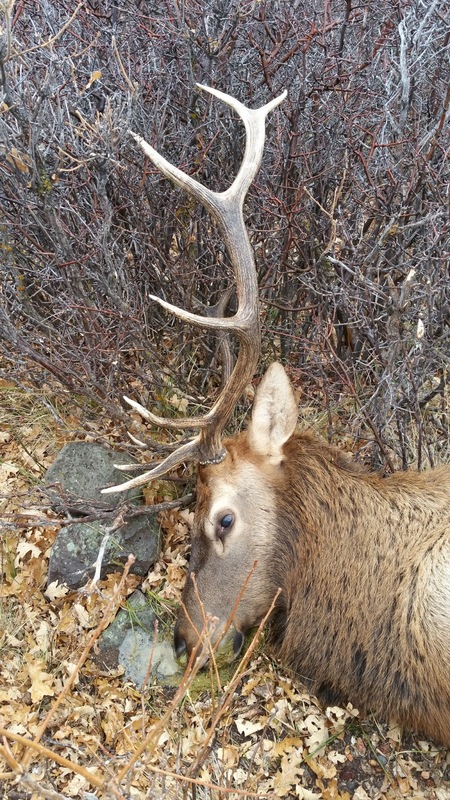 A six point bull elk! On opening morning! It was the first time I had ever got my elk on opening morning. I did a gutless dress out as I waited for Justin and Travis to work their way over to help me. Some other hunters told them that a big bear was ahead of them. We decided to haul out the front quarters, backstraps, and antlers and leave the hinds over night since we did not have our packs with us. The next morning, Steve and I hunted up to do the pack and we discovered that a bear had stolen one of the hind quarters. I packed the other down as Steve continued to hunt. He came out on a different road and so I ended up carrying the hind all the way out. Lesson learned: take the best meat first. Especially when you have two strong young men. 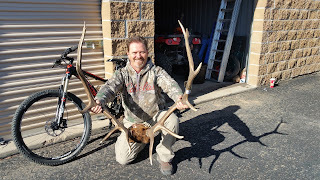 Awesome hunt for me! The rest of the group did not see a single elk all season. Johnny and Donny joined mid week and they hunted all over the mountain to no avail. Donny had his silencer and muzzle break on his 300 which was very nice to shoot.